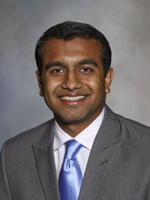 Nikhil “Sunny” Patel is resident physician in psychiatry at Cambridge Health Alliance/Harvard Medical School. He completed his medical school training at the Mayo Clinic School of Medicine, and a masters in public health in global health with interdisciplinary concentrations in humanitarian studies, ethics and human rights and public health leadership at Harvard School of Public Health. He is interested in the intersection of international diplomacy and public health for vulnerable populations in low-resource and conflict settings.